To me, making bread is the epitome of home baking. Plenty of people before me have waxed poetic about the old-fashioned comfort of kneading, the tranquility of waiting for dough to rise, and the satisfaction of eating freshly baked bread that is really unlike any other. That's all true, so let's leave the lyrical stuff to the poets and just get to the recipe, shall we? English Muffin Bread has been making the rounds lately on food blogs, so I thought I'd give it a go. The wonderful thing about this recipe is that it is really bread baking at its best and most basic - you can't simplify this any further. The actual hands-on time is about 5 minutes to make the dough - then you leave it sitting pretty for an hour to rise, a quick transfer to the loaf pan and another half an hour of rising time before it goes in the oven for 40 minutes to turn into a beautiful golden loaf. Hardly any effort whatsoever with minimal dirty dishes to boot. Apart from its shape, this bread is the soul of an English muffin: it's got the craggly gaps and holes, the slightly chewy texture and it leaves a dusting of cornmeal on your fingers. It is wonderful toasted till the edges are brown to the point of black and then spread with butter and jam - or whatever topping floats your boat. This is such an easy recipe to make, and in comparison to my last recipe it's incredibly economical. In fact, you probably already have all the ingredients in your pantry. What are you waiting for? In a large bowl and using a wooden spoon stir together water, salt, sugar, yeast and flour until well mixed. The dough should be shaggy and sticky. Spray a piece of plastic wrap with oil and cover the bowl tightly. Leave it to rise in a warm place for 1 hour, or until it looks bubbly and has doubled in size. Spray a loaf tin with nonstick cooking spray and pour in a small handful of cornmeal - about 2-3 tbsp or so - and tapping around the tin fully coat the inside with the cornmeal. Tap out any excess. Spray a spatula (or your hands) with the cooking spray and transfer the dough into the tin (no need to punch the dough beforehand). Spray another piece of plastic wrap with oil and cover the tin, leaving to rise for about half an hour or until the dough has risen to the top of the tin. While it rises, preheat your oven to 175C/350F degrees. 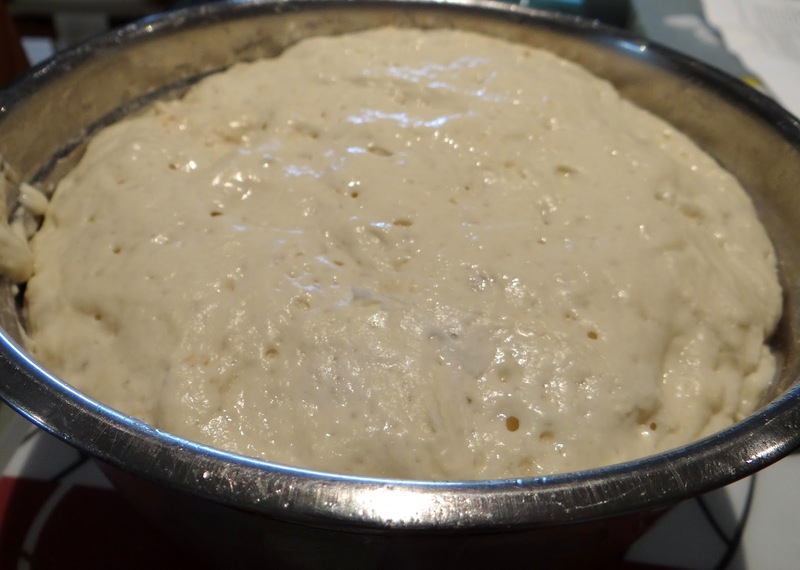 Once the dough has gone through its second rise, put it in the oven for 30 minutes. At 30 minutes, take the loaf out, brush with some melted butter, and put it back in the oven, rotating the tin around so it's opposite from earlier. Bake for another 10 minutes, then take the loaf out and invert onto a rack immediately (careful! It's hot!) and brush again with melted butter. Leave to completely (or, you know, just a little) before slicing. Eat this with your favorite topping; jam, peanut butter, nutella etc. Or for a real treat, toast it and spread with butter.